It took us an hour and a half to finish the round, due to my knee aching up again. Dr. Google claims it to be “Runners knee” with an inflammation on the outside. I will check it at a physical doctors as I get to Perth. Might need some antiflamatory pills. I think it’s easier to explain this to an English speaking doctor than to try it in here on the island. We set out on today’s second exploration of our little island of Nusa Ceningan by driving further “inland” from the hotel. We eventually got to The palm hotel and ordered coffee and juice. We chilled out and looked down on the surfers in the waves at Ceningan point. Quite impressive to watch them get up on the board and ride the waves. We talked about trying, but to wait till we get to Australia. We finished our drinks and checked out the neighbors to The Palm, Jenny’s place. A very nice place with big rooms and a quiet indoor kitchen. We talked to Jenny’s friend, as Jenny was not there. Absolutely a place where we could have stayed. And that made us think that we forward should book just one night for a new place. For then to scout the area and figure out where to settle in. 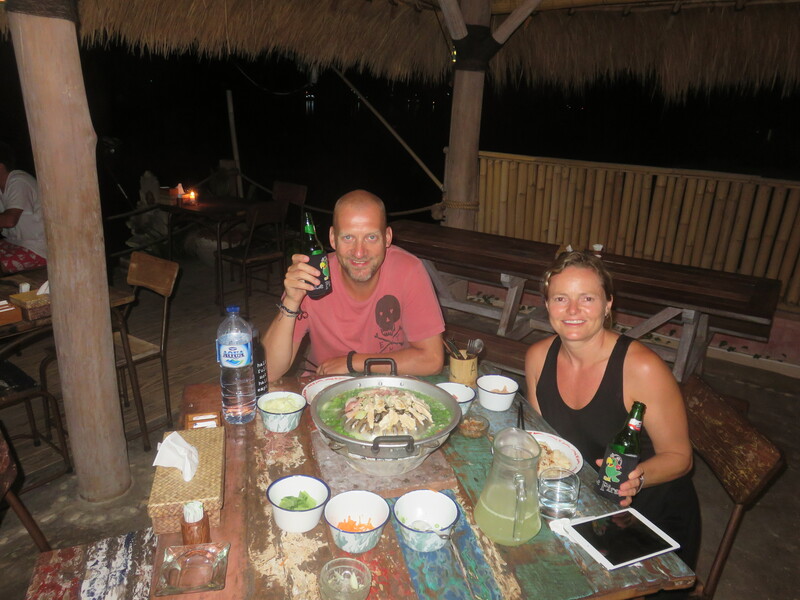 The lunch was taken in at a little warung that deserves no acclamation. It was OK food but nothing more. We got back on the bike and went across the bridge toward Lembongan. We once again made time for a little driving lesson for Katja. On a nice stretch of road she did another little drive by herself. The only disturbing element was a ten year old boy on what seemed to be an overpowered motorbike. But even the new Evil Kenievel could not disturb the determined driver. Katja 2 – Bad experience 1. And regarding the kid one the bike. What’s up with that? All the kids around here wear school uniforms and seem to be in school from around 7. But this kid was hammering the local roads at 13:00? Maybe he is just as the local badasses everywhere in the world, with a distaste for authorities and “no need for school” mentality. Down to the beach we went. We dove into the water and it has not been this warm since our arrival to Indonesia. 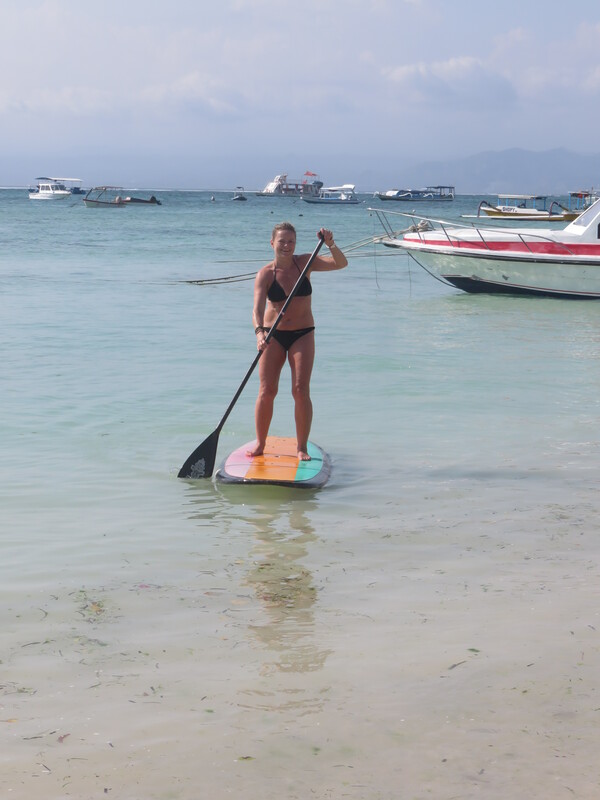 After watching a stranded ferry get loose by burning 250 hp in a futile a attempt, we rented SUP – Stand Up Paddleboard. Oh yeah, out to sea! The man said:”Quick lesson. On knee first, on deep water try to stand.” Then he laughed and said: “Hurt not so much to fall in deep water”. Then he left us. Katja beat me straight out of the starting block. She did not fall once. Me on the other hand can verify that it is more soft to land in deep water. 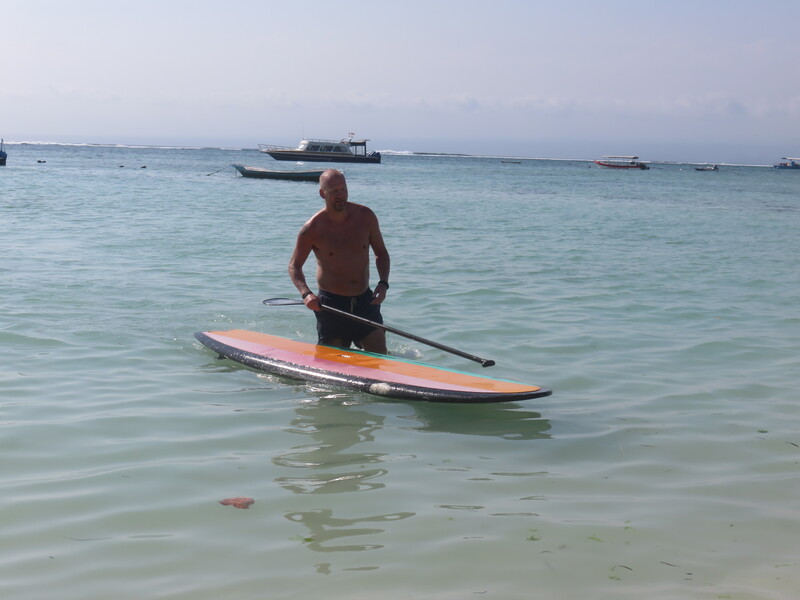 BUT – in the formal competition between us I ended victorious and am now Lembongan champion in SUP. Maybe even Indonesian Champ, since I think this must have been the first real contest arranged. That takes away some of the sting from the hard landing in shallow water. A juice at an overpriced bar on the beach later, we headed towards home. On the way we came across a wood carver in action. 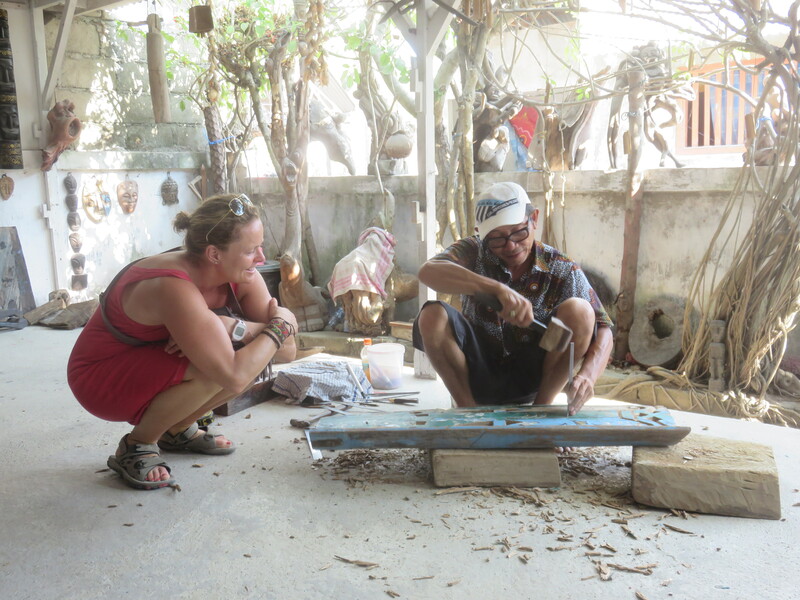 He used drift wood and old boats for bases and produced many nice “sculptures” and carvings. We ended up buying a little something from him, and he was very happy. “No sale yesterday, happy to make sale today.” Yeah, I guess all people in sales can relate to that. If it is directly linked to what you eat tonight it is even more important to get the job done. He claimed there was a post office just up the road and we aim to go there tomorrow to send some more stuff home. 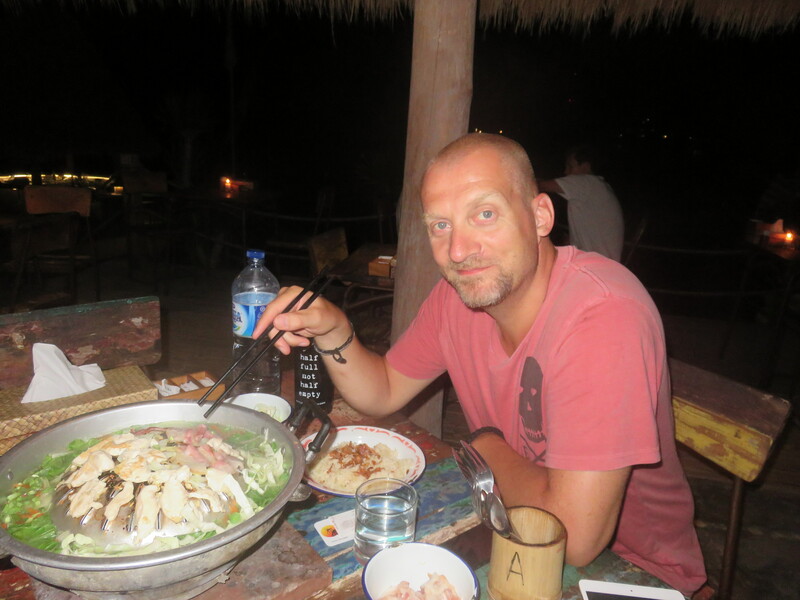 For dinner we were recommended to do the Thai BBQ. It’s a concept none of us knew from before, , but it is somewhere in between Japanese Shabu-Shabu and Fondue. We got lots of veggies and meat to the table. Then a BBQ device like nothing we have seen before. We used chicken broth in it to heat and cook the veggies and a half sphere in the middle to BBQ the meat (chicken and bacon). The whole thing was fired up on coal and it was a cool way of making dinner. It tasted awesome, and several of the other guests came to look at the thing. Some ordered the same afterwards. Then we had a lazy night and Katja did another Skype session with her Ma. Still a work in progress, but better every time.